If you are any type of Foodie or watch the Food Network at all, then you have heard of the lovely Giada de Laurentiis. Her focus on Italian family style dining and warm smile make her hard to forget.It’s no wonder that her kitchen is fit for a chef. 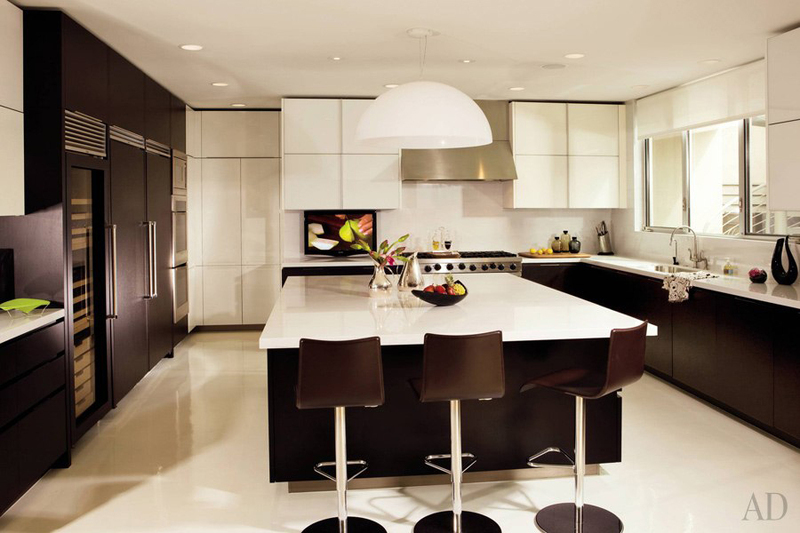 The steel appliances and accents give this room a modern and clean feel. Giada has become a household name and host of hit cooking shows has two identical kitchens. One is in her Malibu home, the other on the set of her show. Her kitchens at both locations are professional yet glamorous. Enormous work and storage space, professional-grade appliance, and sleek good looks characterize both spaces. Dark brown wenge-wood lower kitchen cabinets and sleek white uppers complement the white Carrara marble kitchen countertops and the white concrete floor. The mix of dark cherry-colored wood kitchen cabinets and contemporary white surfaces produces a light and airy modern space. The home kitchen works just as well as set, in case De Laurentiis wants to do show segments from home. Sliding glass doors open to an herb garden in front of the home, and an outdoor kitchen and family room in the back. The oversized island adds more storage and workspace to the room using additional cherry colored lower kitchen cabinets. Style Idea: Make Unusual Colors In The Kitchen Work!